‘Animals in the Jungle’ is an exciting way to differentiate between herbivores, carnivores, and omnivores. Why is it exciting? Because the science worksheet is themed like Madagascar, the movie, and sets up a bright background that will instantly catch the kids’ focus. 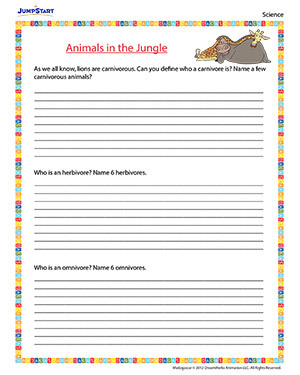 Explore the jungle with our colorful Madagascar worksheet.